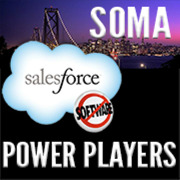 If you use Salesforce every day and want to get more out of it, this meetup is for you. Whether you are a Salesforce newbie, a seasoned administrator, a consultant, a sales manager, or a developer, this meetup gets everyone together to discuss how to be more successful with Salesforce.com. Topics will include: User adoption strategies, integrations with legacy systems vs newer APIs, alternatives to Visualforce and Apex, hacking visualforce and apex, expanding Salesforce.com functionality (easy/medium/hard), and anything else related to the force.com ecosystem. Hope to see you there!